These are examples of pots that their owners love and wanted to share with other members. 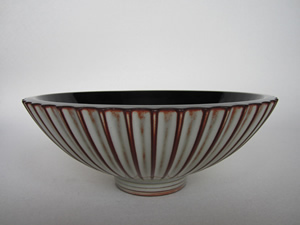 “This large bowl is earthenware and has a stunning rust and cream coloured, ribbed vertically outside with an incredible ‘piano’ black inside. It is 11.5 inches diameter. Looking back I realise I looked at pots admiringly even as a small child. 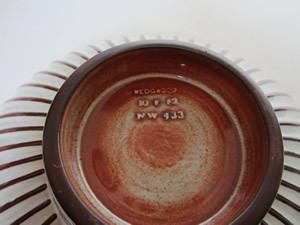 I loved this pot from the moment I first saw it when it was new in 1962 and I was still at junior school. It belonged to my Granny whose youngest son worked at Wedgwood for the whole of his career eventually becoming Sales Director. 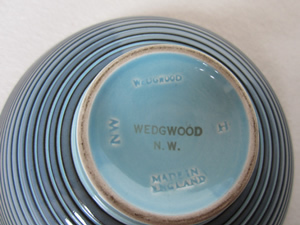 He gave her presents from Wedgwood that I often coveted! When Granny died this stunning bowl was given to me, still in my teens, but utterly hooked on pots”. 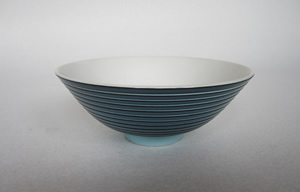 “This small bowl is earthenware and has a cool, elegant, horizontally ribbed outside in blues with a matt white inside, probably Moonstone glaze. It is 6.5 inches diameter. It is a sharp contrast to the rust and black design but equally stunning. Bought in about 1975 this was £5 – a bargain by today’s standards but a third of my weekly wage at the time. Norman Wilson’s shapes are usually exquisite but very simple perhaps inspired by oriental shapes. On both these pieces I find it fascinating how the ridged mouldings enhance the effect of the colour on the outside combined with the daring use of a single colour contrast on the inside. 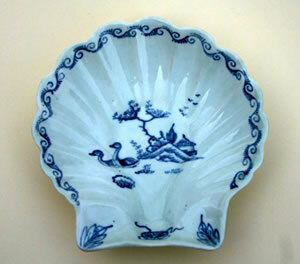 A Limehouse porcelain shell dish decorated in underglaze blue with swimming waterfowl. “Reginald Haggar came to Stoke-on-Trent in 1929 as Assistant Designer at Mintons but after only 6 months, at the age of 25, he became Art Director. His jolly design called “Noah’s Ark”, pattern number C5069, painted in bright enamels was introduced in March 1930 and exhibited at Buenos Aires in 1931. 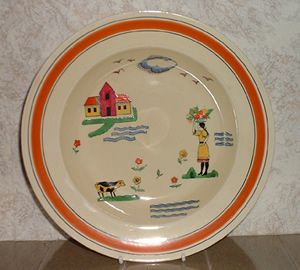 This soup plate always makes me smile”. See CC13. for another Reginald Haggar piece. 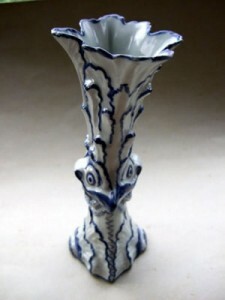 A rare and unusual Limehouse porcelain vase with the mouldings picked out in underglaze blue. 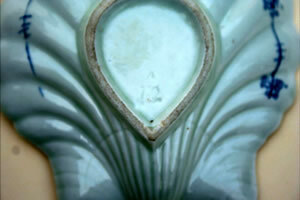 This shape is also found in white saltglaze stoneware and an example of the latter in the Potteries Museum is illustrated by Arnold Mountford in Staffordshire Salt-glazed Stoneware. Also illustrated in White Salt-glazed Stoneware of the British Isles by Diana Edwards and Rodney Hampson, figure 96. 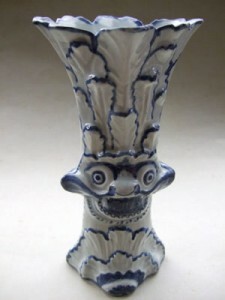 When viewed from the side the grotesque mask changes into a bird’s head. Pearlware figure of Cybele, by William Greatbatch c. 1775. A press-moulded figure of Cybele highlighted under-glaze with manganese oxide colouring. She carries a cornucopia in her left hand, another spills out ‘plenty’ from beneath her right foot. Her left foot rests upon a simple moulding of a lion, acknowledging the myth of her being nursed by lions as an infant. Attribution is supported by a base of this figure being excavated from phase III of the waste tip identified as from the factory of William Greatbatch and illustrated and commented upon by David Barker, (William Greatbatch a Staffordshire Potter, 1990), and Pat Halfpenny, (English Earthenware Figures, 1991). height 13 cm; base diameter 5 cm. This 12 cm tall tea canister was made in 1916 and is one of the 40 000 pieces of porcelain that Hongxian ordered from Jingdezhen as soon as he became Emperor. The red seal mark on the base labels it for the “Hall Where Benevolence Resides” which is where Hongxian set up his imperial residence in the Zhongnanhai palace complex in Beijing.